Background: The Rumex nepalensis Spreng (RNS) is a traditional Chinese medicine containing rich anthraquinones. However, through proper investigation we have found that there were no reports on the pharmacokinetics of RNS extract in rats. Objective: We study on the pharmacokinetic behaviors of emodin, chrysophanol and physcion after oral administration of RNS extract in rat to achieve a better understanding of further clinical application and conduct the preparation development of the herb. 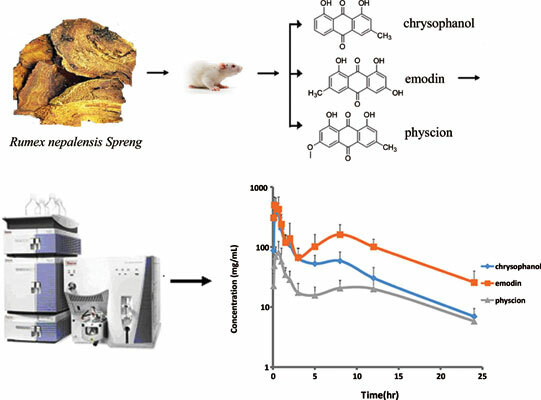 Methods: In the present study, a sensitive and rapid ultra-fast liquid chromatography tandem mass spectrometry (UPLC-MS/MS) method was developed and validated to determine the three anthraquinones such as chrysophanol, emodin and physcion in rat plasma along with danthron as the internal standard (IS). The analytes and IS were separated on an Acquity UPLC HSS T3 column (100 mm × 2.1 mm, 1.8 µm) by using the mobile phase of water with 3 mM ammonium acetate and acetonitrile as gradient elution at a flow rate of 0.4 mL min -1. The detection was performed on a triple quadrupole tandem mass spectrometer equipped with electrospray ionization (ESI) by multiple reactions monitoring (MRM) of the transitions at m/z 253.1 → 225.0 for chrysophanol, 269.0 → 224.9 for emodin, 282.7→ 240.0 for physcion and m/z 239.0 → 211.0 for IS. The limit of detection and lower limit of quantification were both 2 ng mL -1 in rat plasma. Results: Good linearity of this method was obtained in the range of 2-1000 ng mL -1 , and the correlation coefficient was greater than 0.990. According to regulatory guidelines, the established method was fully validated, and the results were within acceptable limits. Conclusion: The validated method was successfully applied into a pharmacokinetic study of orally administered RNS extract in rats. Rumex nepalensis Spreng, UPLC-MS/MS, pharmacokinetics, anthraquinones, rat, plasma.